Happy Saturday! I'm Jen Rzasa from Our Change of Art and I'll be your hostess for the next 2 weeks! 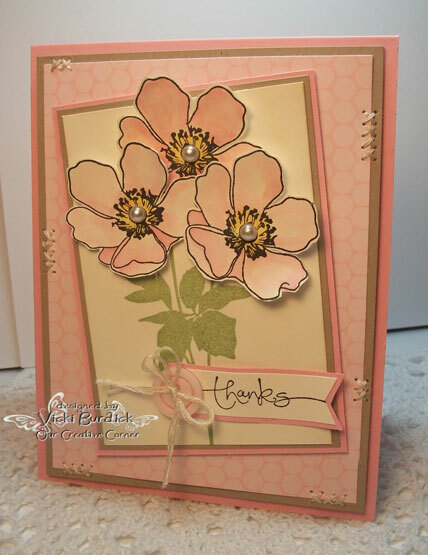 I first want to thank everyone for participating in our last challenge - your easel cards were awesome! The Top Talent and Talented Trio will be announced on Wednesday. The theme this week is Fab Floss! Anyone who has visited my blog has likely noticed my obsession with embroidery floss. As a kid I used to buy it to make friendship bracelets and my supply of floss just grew and grew! I think my little box of floss (organized in rainbow order, of course!) 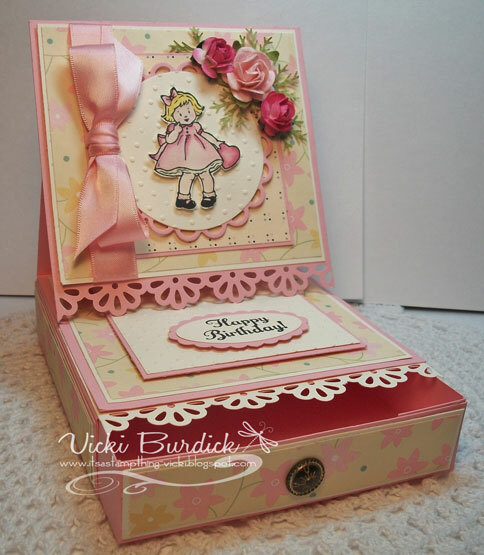 was neglected as I got older, but it made a big comeback when I started papercrafting 2 years ago. 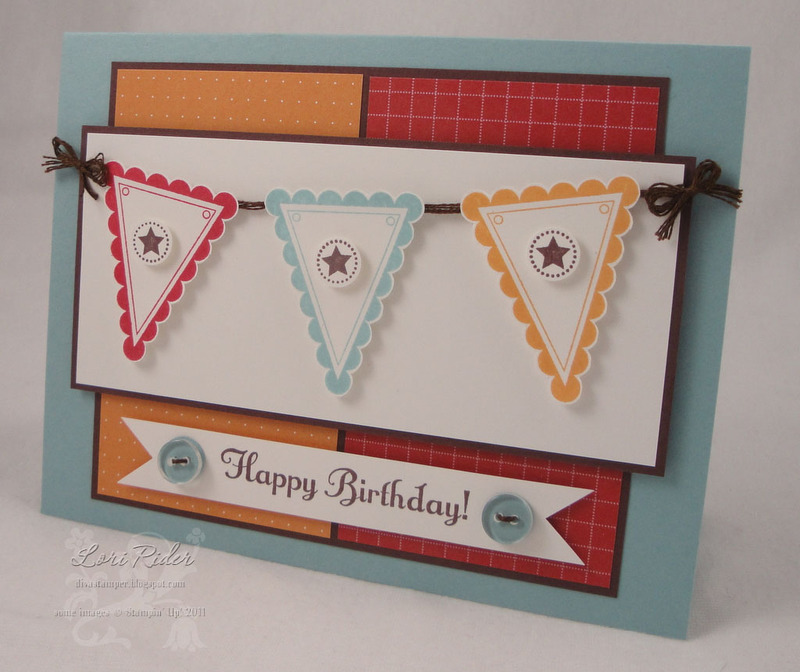 Embroidery floss is a versatile embellishment that can be used to jazz up your cards and papercrafting projects. It's inexpensive, fun to use and comes in every imaginable color. 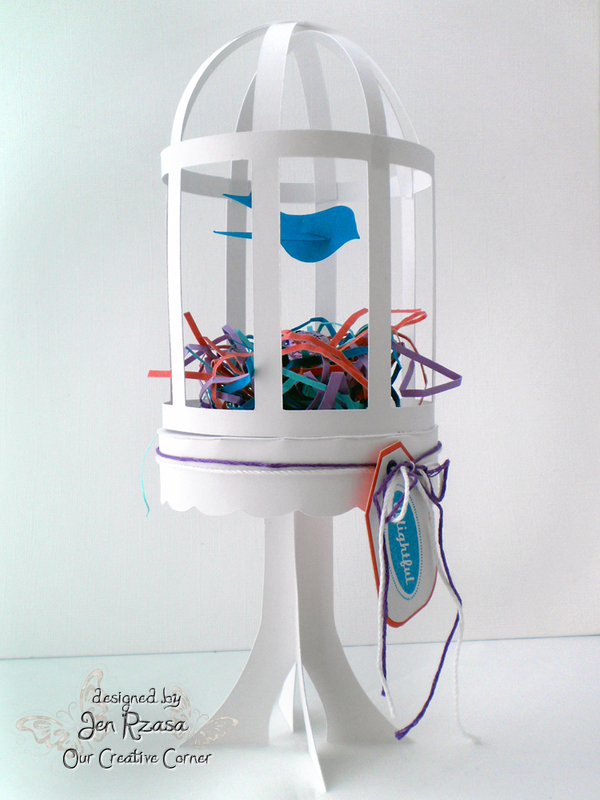 edited to add: Baker's Twine and floss are not interchangeable....please use embroidery floss in your project. Thanks! 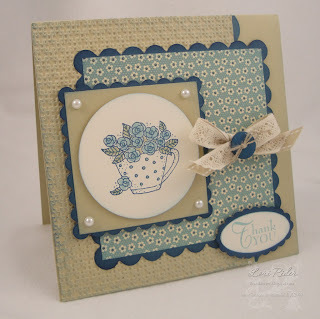 My challenge is to think beyond embroidery to incorporate floss into your next project! 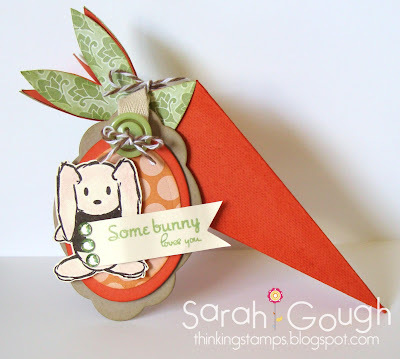 Check out the awesome projects from the DT as well as our fabulous Guest Designer! Rebecca added adhesive to painted wooden wings and covered them with shiny floss. I hope you can play along with us this week! Hello everyone! So happy to see you back today to check out the winners of our 3-D Easter project. We had some super sweet entries. We loved seeing what all of you made. Thanks so much to everyone who joined in the fun with us that week. It was another tough week for the DT to come together and pick a winner - there were so many on our short list this week! But in the end we finally settled on our Top Talent and our Terrific Trio. 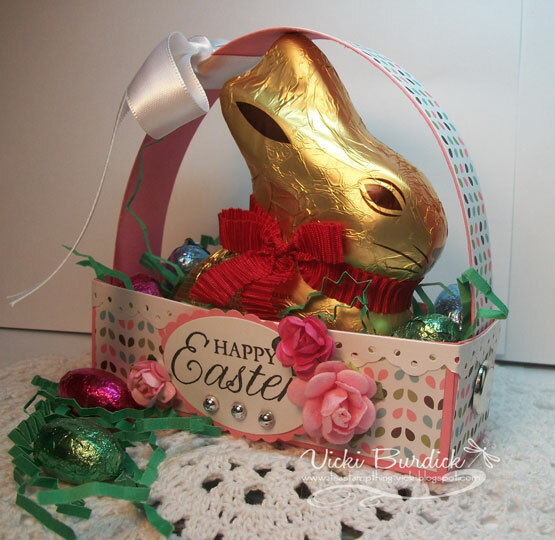 For our Easter 3-D project, the Top Talent award goes to Shaz at Simply Shaz for this beauty. We loved the way Shaz used the soft spring colors. 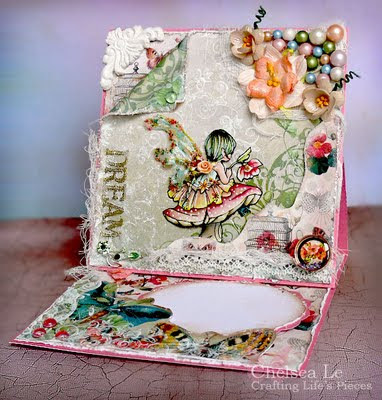 Everything is perfectly balanced with the embellishments - not too much, not too little. Wonderful attention to detail - even the twill ribbon is sponged. The cracked glass technique on the top of the box and the butterflies are truly the icing on the cake. Congratulations Shaz for another fabulous project. Now on to the Talented Trio. 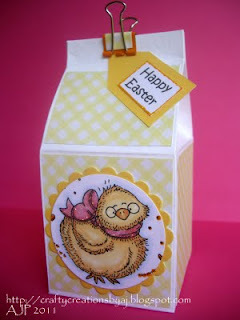 We thought her mini milk cartons were so cute! 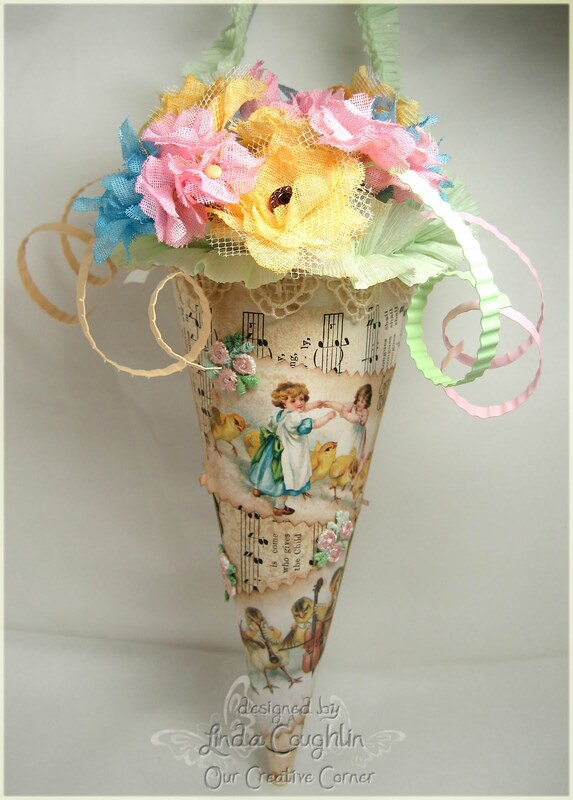 She really kept her piece form becoming lost in over embellishing. 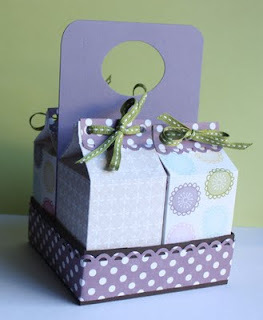 The colors are perfect for this challenge and her milk cartons are perfectly executed. 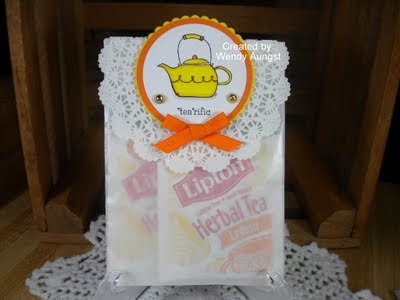 Putting four of them together makes a wonderful give presentation. Amanda from Crafty Creations by A. J. We loved the CAS feel of this project with the simplicity and the clean feel of the gingham paper. Great job of coloring that sweet check too. 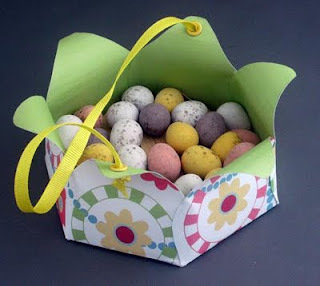 Another project with perfect colors for Easter. 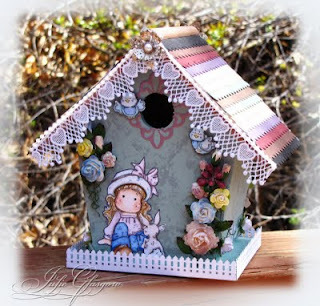 There were so many wonderful details on this project including completely decorating the back side. 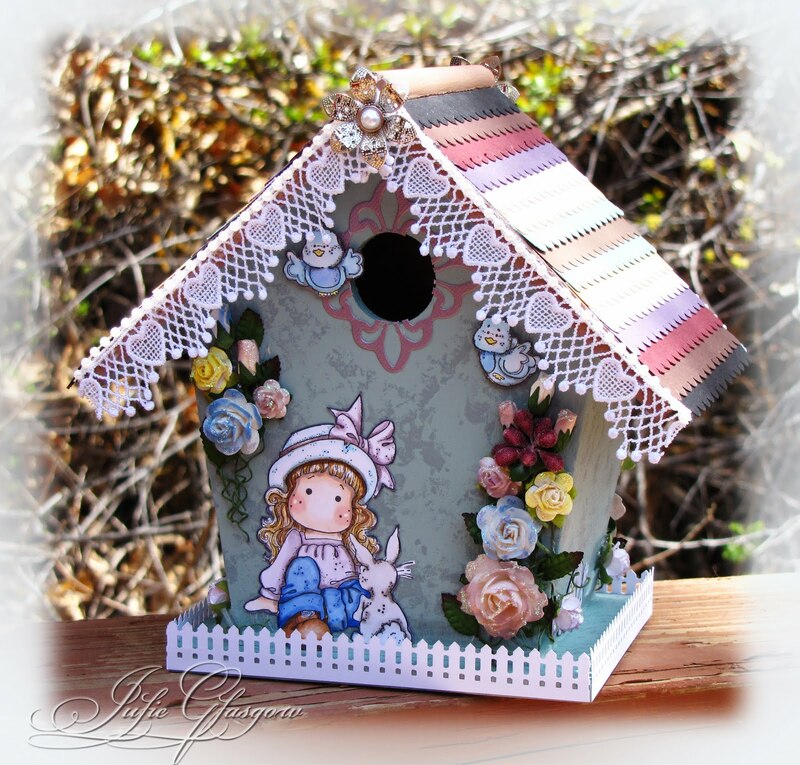 We thought the way the lace drips from the rafters and the white picket fence were totally delightful. 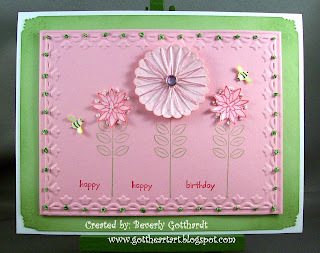 Sweet flower garden too and lovely job coloring the Tildas. Congratulations ladies - absolutely wonderful job by all of you. 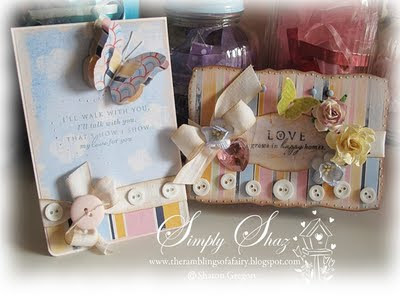 Please feel free to grab our Talented Trio winner's badge from the sidebar and display it on your blog. Well, that wraps up another winner's post here at Our Creative Corner. 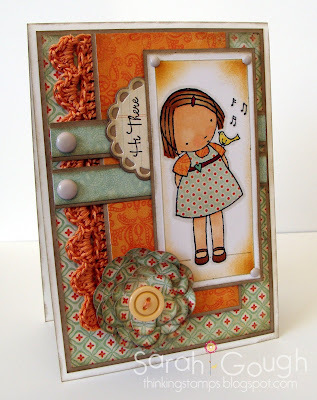 If you haven't already joined in our Easel Card challenge, we hope you will. You have until Friday, April 29th at 11:59 p.m. Eastern Time to enter. Hope to see you there! Welcome friends! Vicki here again, I will be your challenge hostess again this week. Thanks to all of you that joined us last week for the my 3-D Easter themed challenge . We will announce the design team's top picks on Wednesday. Until then, join us for this week's challenge! 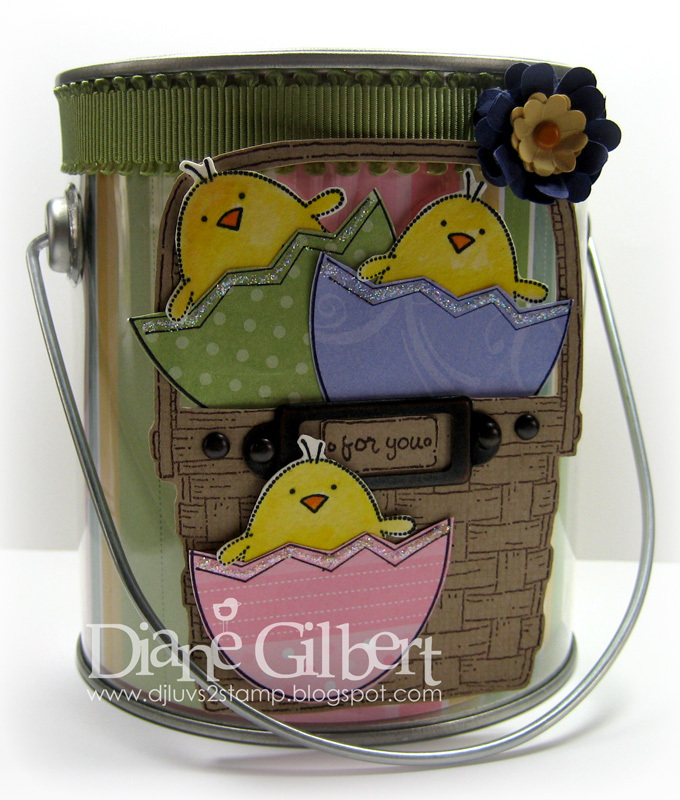 This week I am challenging you all to make an Easel Card. There are so many takes on this popular type of card. Here is a link to a tutorial for a standard easel card. I have seen many variations on this idea using different shapes, so experiment and have fun! To help get those creative juices flowing, take a look at what our super creative design team have created, as well as our Guest designer. Welcome back to the Wednesday winners' post here at Our Creative Corner. 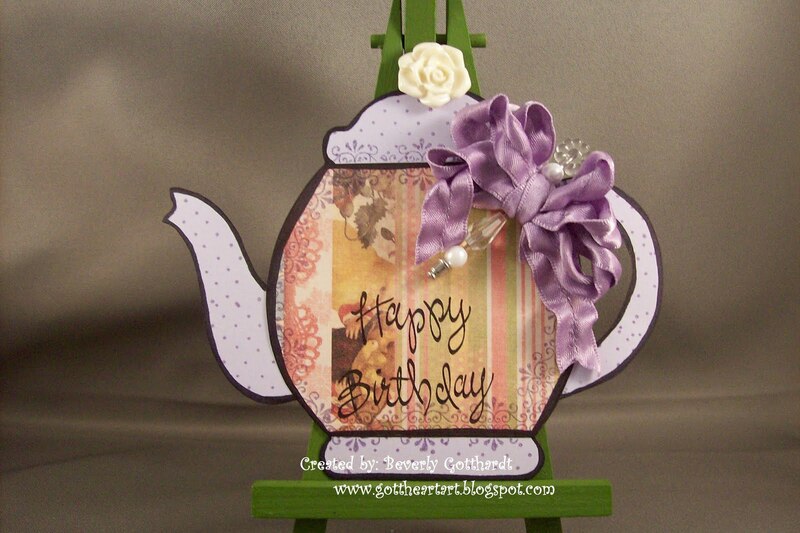 Thanks so much to all of you who came to our tea party! All the entries were just lovely for the 'It's a Tea Party' challenge. There were so many magnificent makes that it was a tough task for the design team to settle on just one top talent and three more for the terrific trio! We had to take a little more time this morning to kick some decisions around. We finally agreed and here are our winners for that challenge. 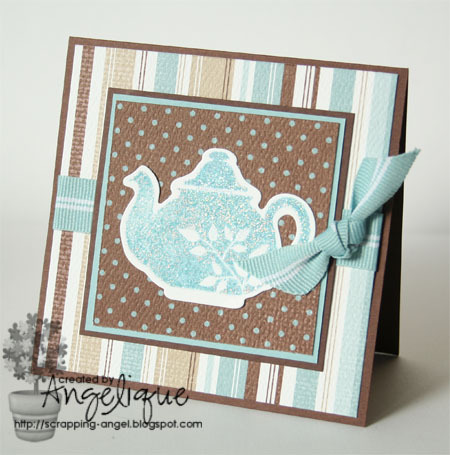 Angelique used classic color combos that really pulled the card together, and gave her card a clean tailored look and feel. 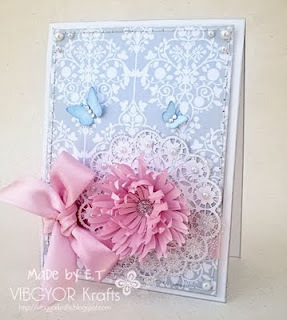 And her clean and simple style really made the card sweet! Congratulations Angelique, on taking home the Top Talent award this week. Please help yourself to the award badge on our sidebar and look for an email or comment from us inviting you to guest design for us in an upcoming challenge. Sarah created an unique and very interesting piece. Her risque image shows the 'sexier' side of drinking tea. 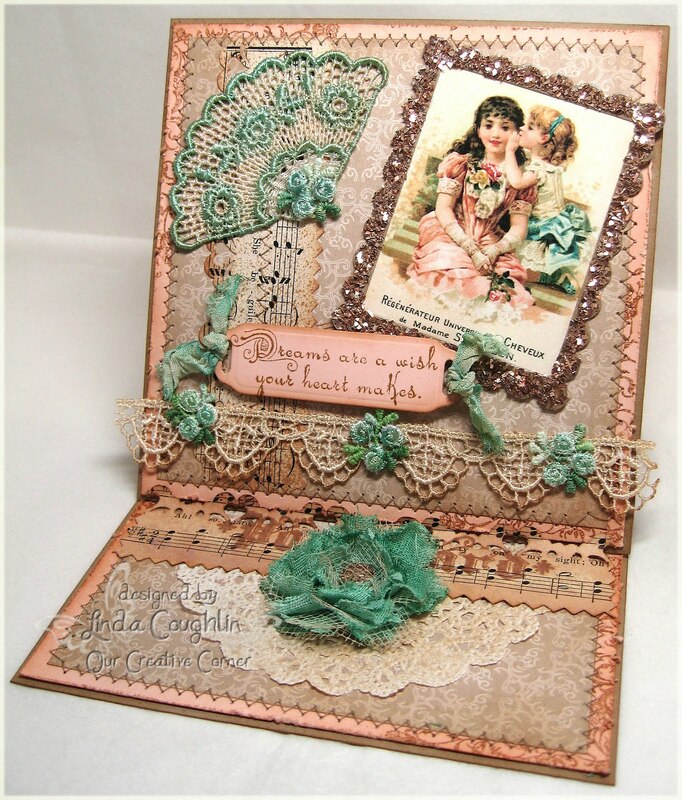 She pulled the whole piece together with the text from the book, and the vintage walnut stain applied to her card and embellishments unite the piece. 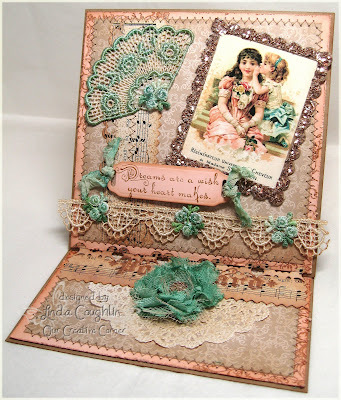 Simply a beautifully executed vintage piece. Beverly's shaped card (teapot) is as cute as can be. 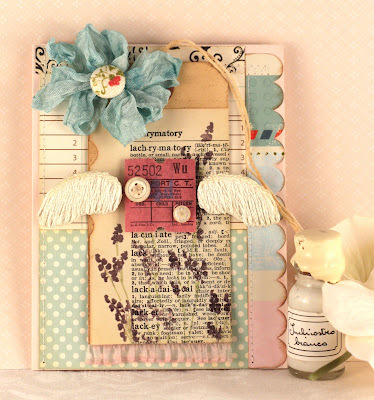 The papers work wonderfully with the theme and the purple bow is fabulous! 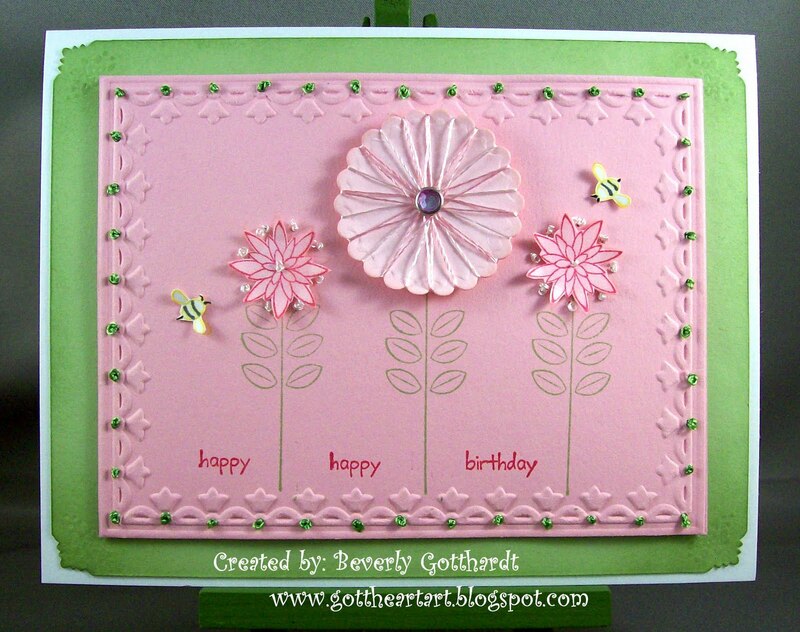 Wendy created a simple and super sweet project. A clever way to use a glassine bag, and the doily helps make the project work with the theme. Congratulations ladies! 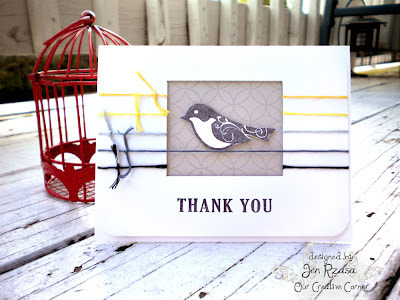 Thanks so much for playing along with our challenge and for your beautiful work. Please help yourselves to the Talented Trio winners' badge on our sidebar. Thanks again to everyone who joined the fun at the tea party. 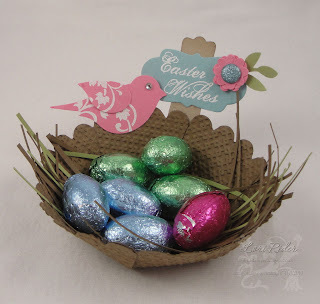 Don't forget, we have a 3-D Easter project challenge running through Friday night at 11:59 p.m. Eastern Time and we hope you will show us your most beautiful Easter makes. No cards please - we want to see some real three dimensional projects. Good luck to all of you in the challenge this week. Hello Peeps! We're excited to have you with us this week at Our Creative Corner! 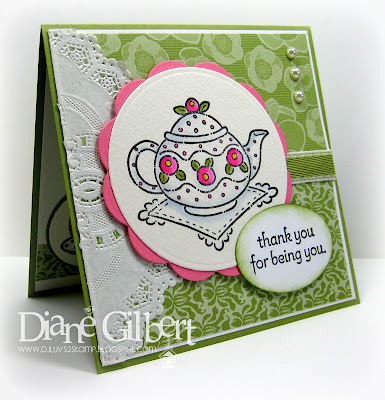 Thanks to all of you that joined us last week for Sharon's Tea Party challenge. We will announce the design team's top picks on Wednesday. Until then, join us for this week's challenge! I'm Vicki from It's a Stamp Thing and I will be your hostess this week! 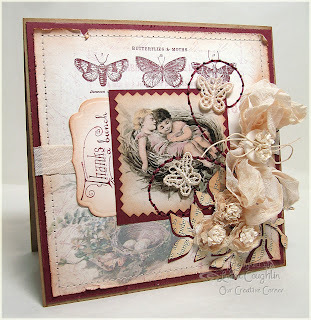 I'm new to the OCC Design Team and this is my first time hosting a challenge here...are you ready? 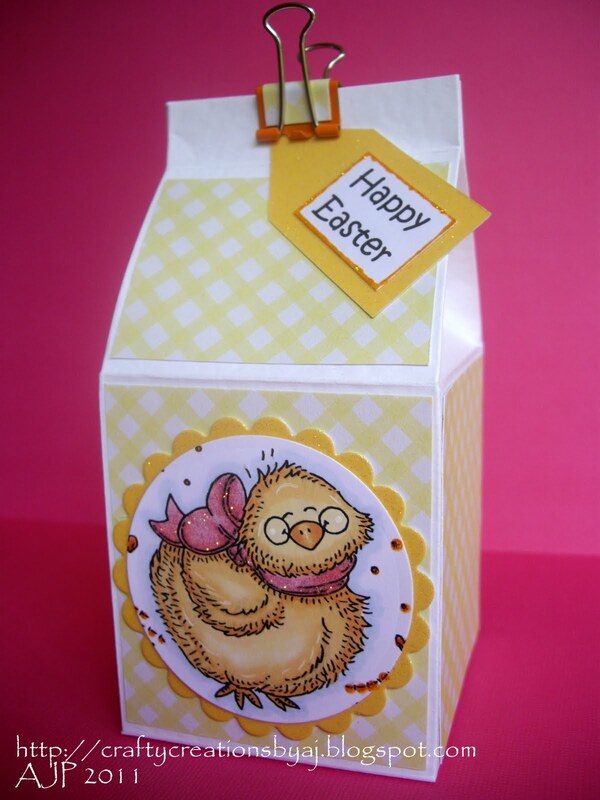 This week we are making a 3-D Easter Projects. 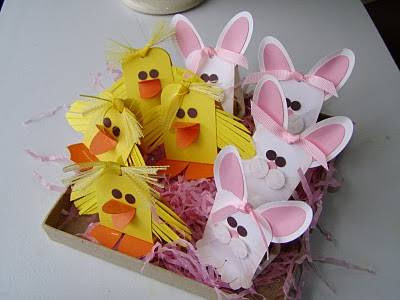 Any kind of 3-D project that says Easter to you, sorry no cards this week. To help get those creative juices flowing, take a look at what our super creative design team have created, as well as our Guest designer. We had so much fun with Sharon's Girl Power challenge and we hope that you did too. 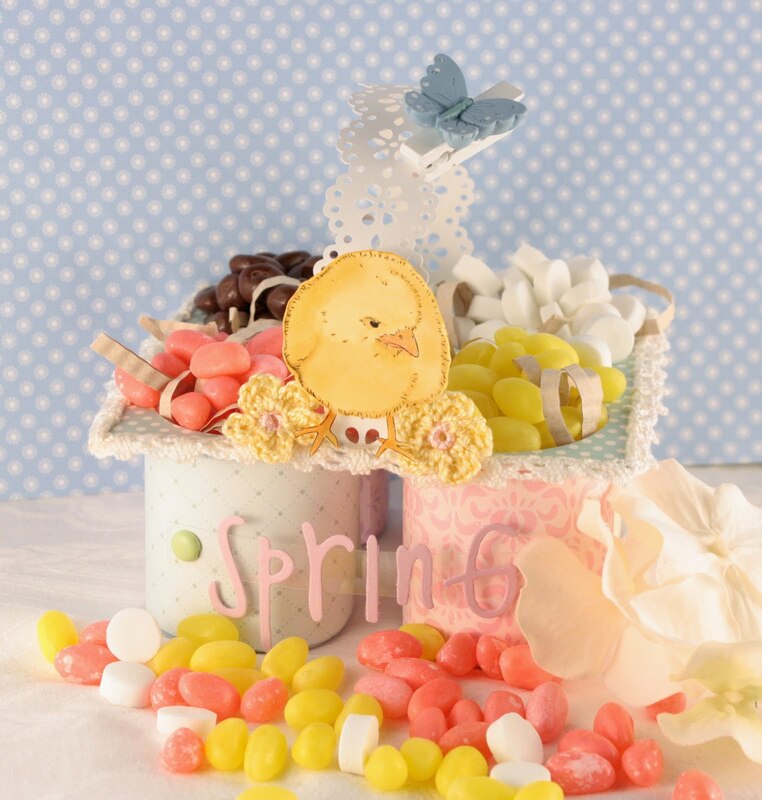 We enjoyed visiting the blogs of all our players and seeing the beautiful eye candy that you all made! We want to thank everyone who played along. It was a tough decision process to pick the winners but we finally made our decisions. 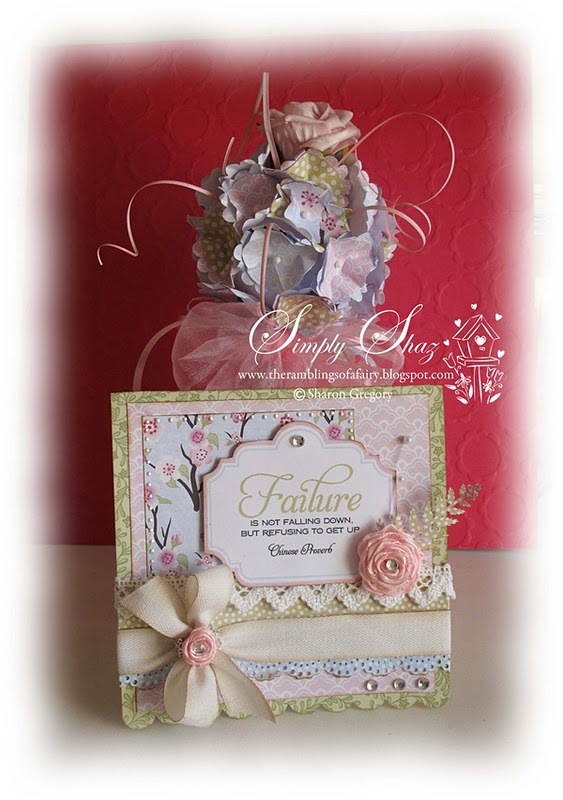 The floral bouquet is simply stunning and we loved the soft, girly colors of the card. The beautiful texture and patterns really captures the eye and keeps it moving. 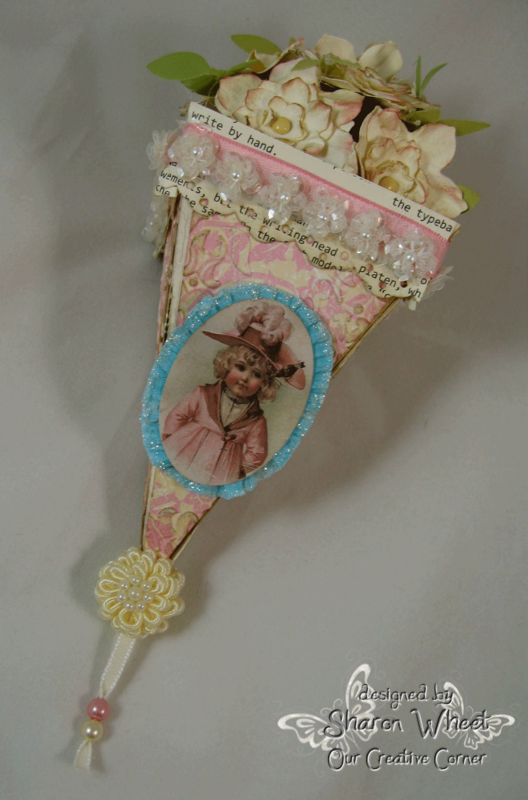 Her handmade ribbon flowers are the perfect finishing touch. Congratulations Shaz. Please grab your Top Talent winner's badge from our sidebar. 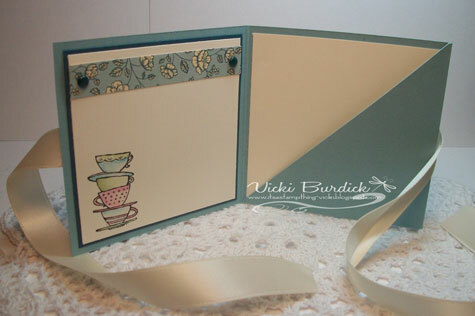 We'll be contacting you soon to invite you to be a guest designer for us for an upcoming challenge. 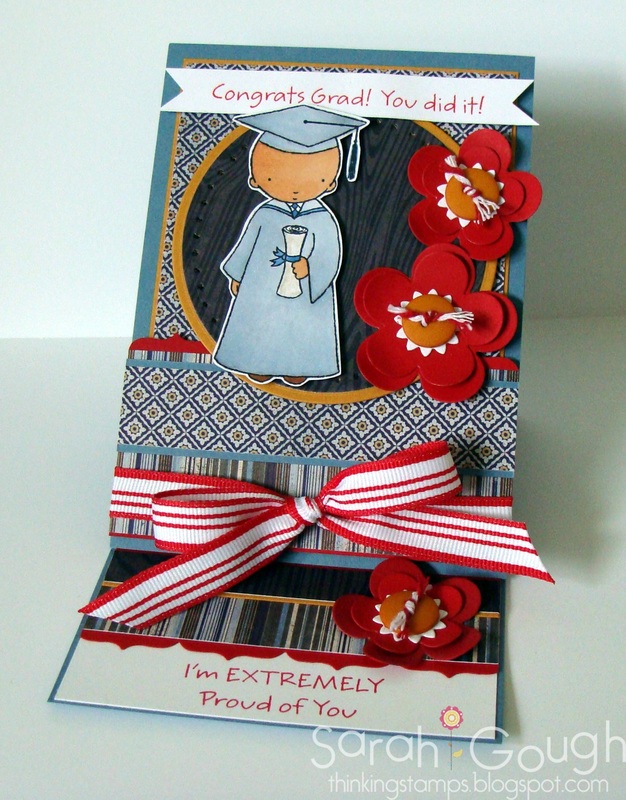 We've selected the next three gorgeous cards as our Talented Trio Award winners for this week. 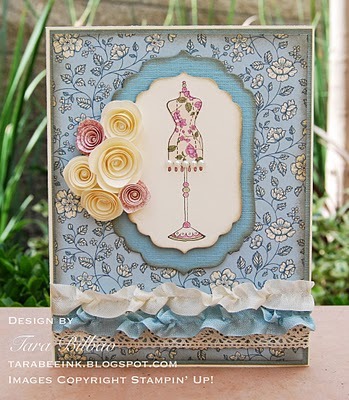 We thought Tara's card was pretty and girly without being overly frilly. She did a beautiful job on that patch of rolled flowers and the layers of ruffly ribbon and crocheted lace are perfect for this vintage style card. 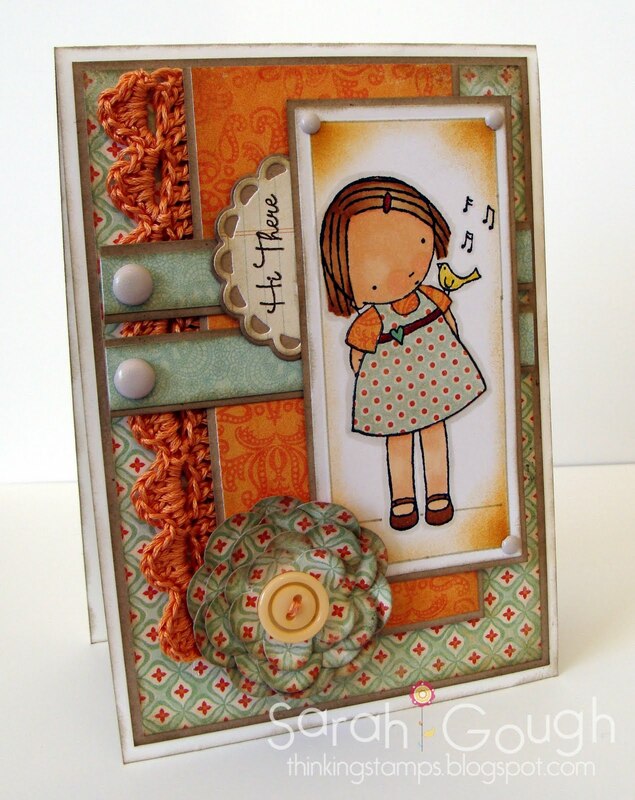 Theresa's card captures the essence of girly using non-traditional colors. We loved the green and gray she chose and the embellishments are wonderful. 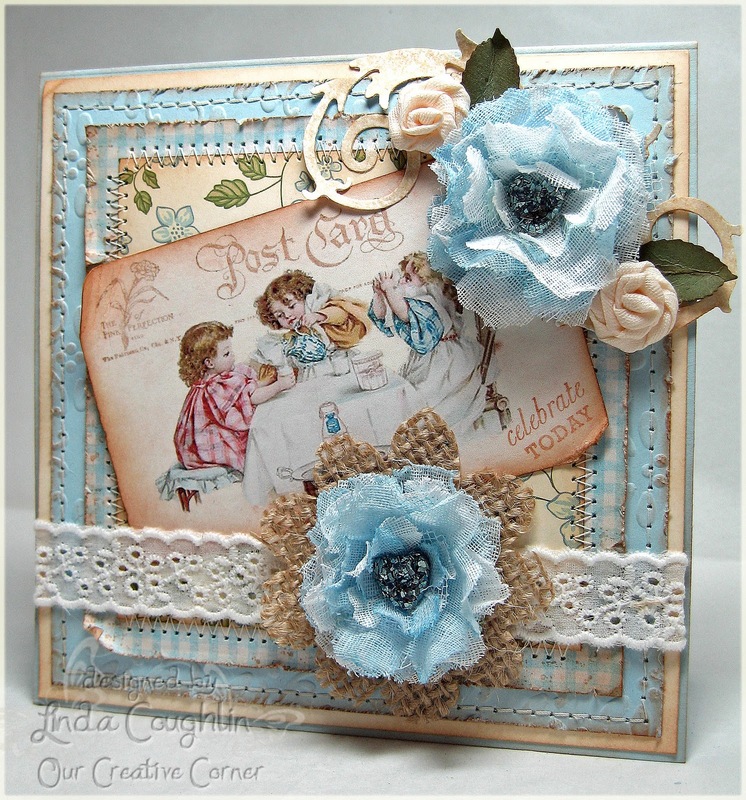 Just a sweetly shabby girly card. E. T.'s card comes together just beautifully. It's soft, pretty and easy on the eye - simply girly in a sophisticated way. 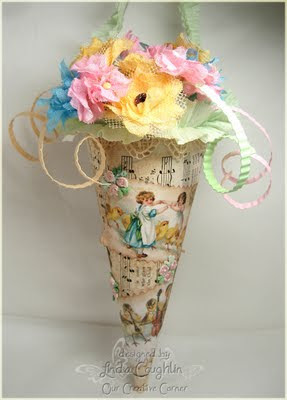 Totally wonderful handmade flower and the doily she used is exquisite! Nicely done ladies! Please feel free to pick up your winners' badges from our side bar. Congratulations to all our winners this week. And don't forget, our current challenge is still open. 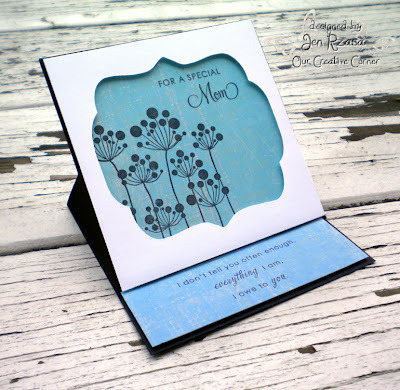 You can enter a card or project up until 11:59 ET on Saturday, April 15th. If you've already joined in, we thank you. If not, we hope to see a creation from you later this week. And don't forget to stop by on Saturday to check out the new challenge and the line up of samples by our talented design team. Good Morning! My name is Sharon Wheet, of Designs by Sharon, and I will be your hostess again this week. Thank you to everyone who participated in our last challenge! Your projects were amazing, as always. This week we are having a tea party! Create a card, 3-D project, scrapbook page, etc. 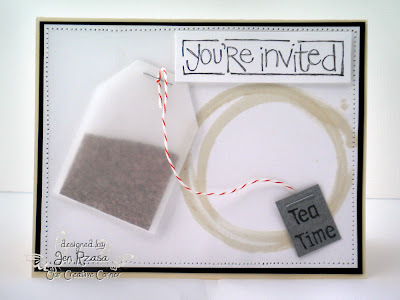 Make your item around an afternoon tea/tea party theme! Get creative, and at most, have fun! 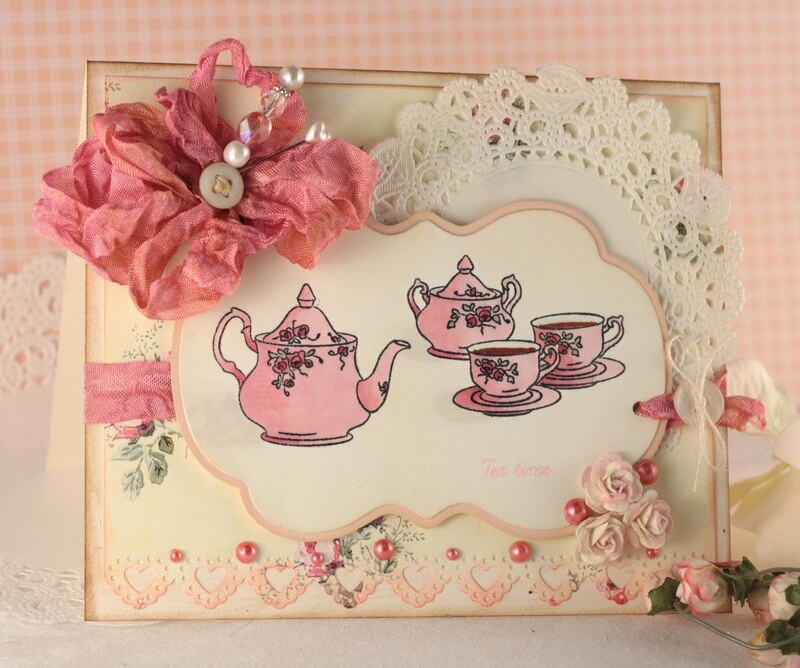 Get out those adorable stamps with tea pots/tea cups, your doilies, all things that scream "afteroon tea!" 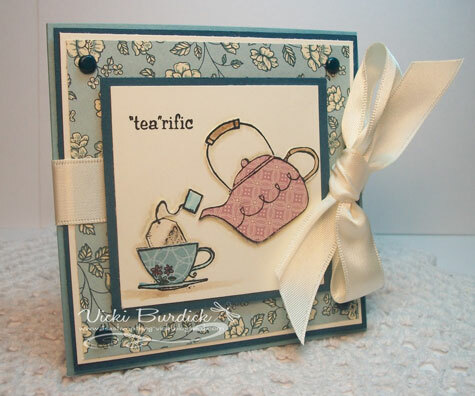 And when we are done, we can sit back and enjoy a spot of tea. 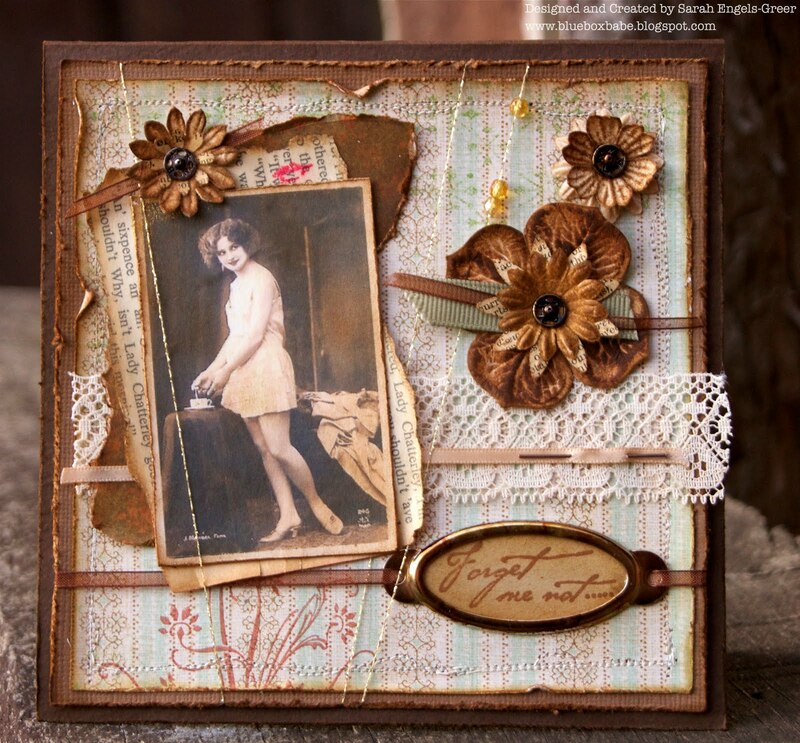 Now, let's see what you created and let us know what inspired you! 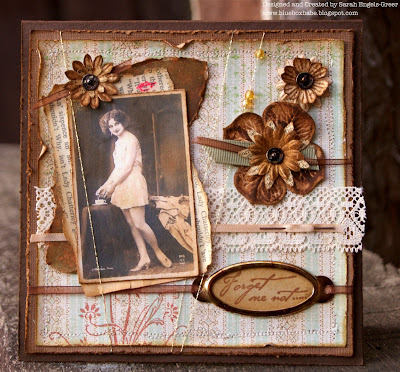 Check out the amazing projects from the DT, as well as our guest designer, Grace Nywening. 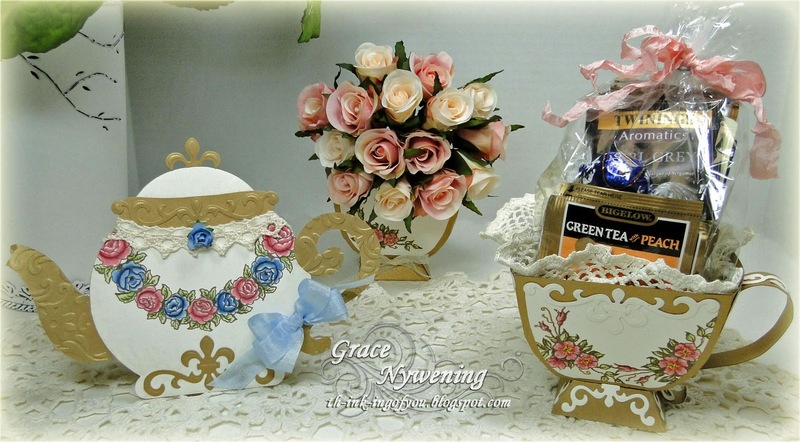 Be sure to see Grace's blog for close ups of her beautiful tea set! Marie Antoinette themed afternoon tea invitations. Aren't their projects great!? We can't wait to see what you make!